Q. Why Did Adam Eat the Apple? A. The simple answer is that he was persuaded by the serpent (the devil) that eating the apple would be to his benefit. That he would “become like God” if he ate it. Sadly, Adam believed this lie and chose to disobey God who told him not to eat it. This was the first sin and resulted in humanity falling from what we call Original Innocence. But to give a more thorough explanation, let’s consider the entire story in a broader way. First of all, did Adam actually eat the apple? Perhaps, but perhaps not. It’s important to understand that this story is not to read in a “literal” way. But that doesn’t mean it’s not true. A good explanation of this comes from Cardinal Ratzinger in his book “In the Beginning …: A Catholic Understanding of the Story of Creation and the Fall” (Wm. B. Eerdmans Publishing). In that book, Cardinal Ratzinger (who later became Pope Benedict XVI) stated, “It has become clear that the biblical creation narratives represent another way of speaking about reality than that with which we are familiar from physics and biology.” He went on to explain that these stories “represent truth in the way that symbols do — just as, for example, a Gothic window gives us a deep insight into reality, thanks to the effects of light that it produces and to the figures that is portrays.” In other words, the story of Adam and Eve is true, but not necessarily in the way a science book is. A science book presents truth in a literal way, explaining the physical truths as they are in this world. 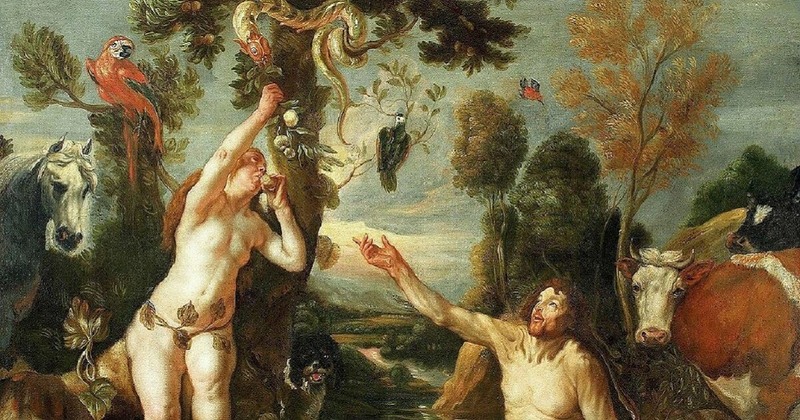 The story of Adam and Eve presents truth in the form of a symbolic narrative. Whether or not Adam actually ate the apple in the literal way explained in that symbolic narrative is not important. What is important is the truth that narrative presents. So what is the truth it presents? It presents us with the fact that our first parents turned from God in disobedience. The consequence was a fall from the original state of innocence and union with God that they were made for. Therefore, the answer remains that Adam “ate the fruit” for selfish motivations because he believed the lie that disobeying God was better for him. He was selfish and failed to trust the truth of God.